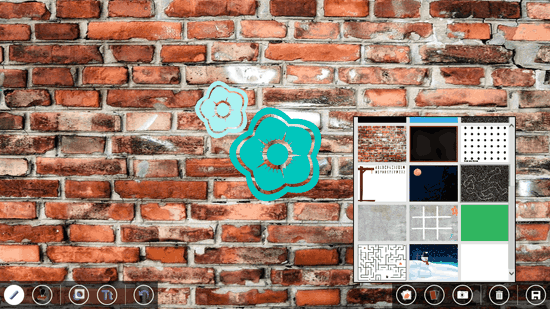 Doodle Buddy is a free doodle drawing app that is available for Windows 8 and 8.1 PC. It is a good app for drawing for kids. The app has a simple user-interface with small icons of the tools at the bottom of the app screen. 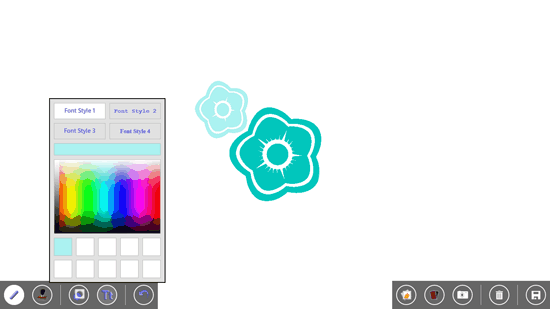 The tools in Doodle Buddy are drawing tools such as chalk, pen, brush, glitter, smudge and eraser. Beside it there is a stamp tool which applies different stickers on the canvas when you click anywhere on it. Then there are stencils in which you can color and then the stencil is on your canvas; you can resize the stencil using the bottom corner edge of it, there are some stencils that are locked and can be unlocked by purchasing the app. After stencils tool, you will see tool for text. With this tool you can add text to your canvas or drawing. The color and font can be changed directly from this tool. At the end of this tool panel you will see an reverse arrow icon, this icon is to help you undo the action you have done on your canvas. You can also check out games like doodle hangman and doodle biker for Windows 8. On the right side tool dock, the first icon is to help you to import the photographs or images from your computer into the app. The second icon is for adding background to the canvas, there are many background options like a night scene, brick wall, join the dot, tic tac toe, etc. Beside this there is a camera icon which can take your picture and add it to the canvas. The trash icon helps in clearing or deleting the entire canvas at once. You can save the drawing with the help of the last save option. The image will be saved as a PNG file.